DUBAI, UAE – The Burj Khalifa’s transformation into the world’s tallest World Cup scoreboard is stunning fans in Dubai and around the world. During each match, the 828-metre high building’s 1.2 million LEDs act as pixels to display a live stream of updates, and light up with the flag of the winning nation. This is just the latest innovation at the world’s tallest skyscraper, which continues to establish itself as a focus for world-class technology and events. 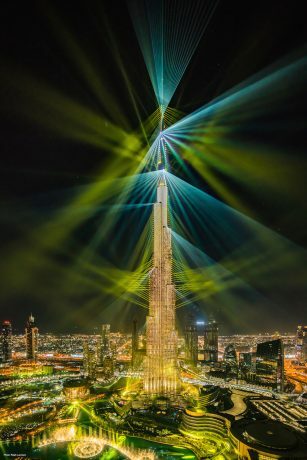 Six months ago, it all kicked off with a spectacular New Year’s Eve ‘Light Up 2018’ launch, masterminded by Emaar Properties and realized by AO Creative, that broke from all conventions to stage a Guinness world record-breaking, multimedia light and sound show. 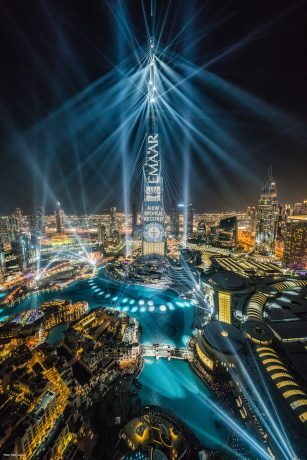 Emaar Properties’ ambitious vision for the New Year’s Eve event was fulfilled by AO Creative, the creative division of Arts Outdoor Lighting Technology. 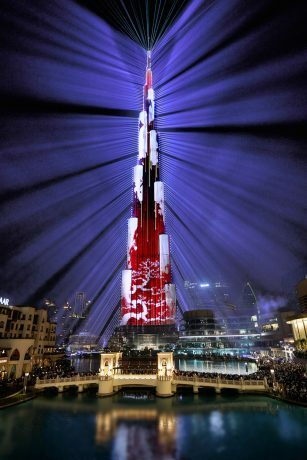 More than one million people descended on Dubai to watch it live. In addition, over 2.5 billion viewers saw it through live TV broadcasts and online streams. Always willing to embrace a new challenge, AO Creative’s open-minded approach, combined with its expertise in delivering unrivalled and unique multimedia design solutions and full production, meant that it was Emaar Properties’ partner of choice to deliver Dubai’s 2018 New Year message. From the outset, Emaar Properties’ vision was to create the most advanced and visually exciting New Year countdown on the planet. 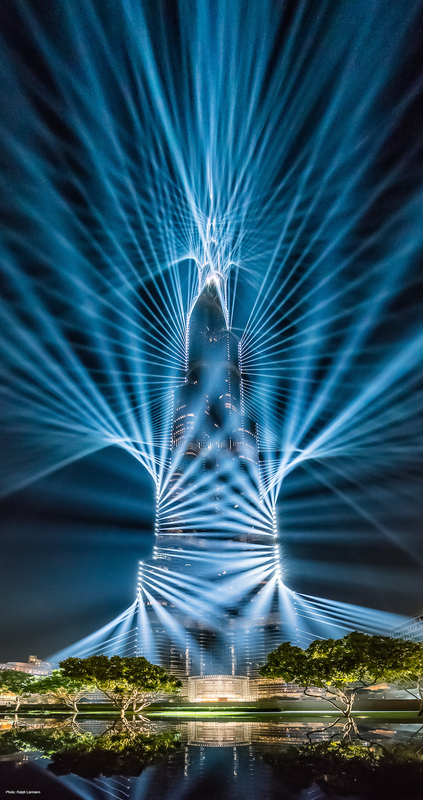 At times space warping, the immersive installation visually remodeled the 828-metre-tall Burj Khalifa tower and its surrounding area, enabling audiences to see Dubai from a whole new perspective. The result was an atmospheric fusion of fountains, light, sound and video. Inspirational content included Arabic calligraphy, geometric designs and the story of Sheikh Zayed bin Sultan Al Nahyan, the UAE’s first president. The LED façade of the tower acted as the central storytelling element, while sharp beams of light framed the building’s distinctive shape. The challenges of rigging an event on such a massive scale were considerable. Working at extreme heights, AO Creative’s team of design engineers and technicians were tasked with framing the entire building with powerful light beams and installing a crane at the very pinnacle to create a platform capable of supporting three heavy laser units and three huge outdoor searchlights. Once the installation was in place, ideally the creative team would have run the show in its entirety many times over. However, the content and its nature had to be kept secret until New Year’s Eve. This was never going to be easy when the canvas is visible from across the city and beyond! To maintain secrecy, viewing time was restricted to twenty-second segments of the show, and relied on the skill of the creative team to ensure any anomalies were ironed out well before the show ran in full at 11:59pm on New Year’s Eve 2017. Emaar’s Light Up 2018 not only conquered a massive creative and technical task but set a breath-taking milestone by breaking the Guinness world record for the biggest lighting installation in the world for a New Year event. In all it took 280 moving lights rigged around the frame of the building, along with LED screen and special outdoor beam lights rigged on the façade edges to deliver. Around 550 fixtures were used in total, many of them having to be dismantled to fit in the lifts and then rebuilt in their rigging location. In addition, AO Creative managed a team of over 300 specialist engineers, riggers and technicians, who built and installed nearly 120 tons of equipment and ran over 29 kilometers of cabling.